Slot Machine published 17 years ago by WMS Gaming, Inc.
Wild Wilderness © 2002 WMS Gaming. The camping themed Wild Wilderness slot game is a riot! Players will love watching Bernie the Bear rummage through the campers’ things and try to fool the forest ranger by dressing in hilarious disguises. The Wild Wilderness Bonus is initiated when three or more Bernie the Bear symbols appear on an active pay line. The scene changes to a campsite environment. One of the camping characters has set up camp and is roasting marshmallows over the fire. Bernie the Bear is itching to get his hands on one of the items that the camper has thrown on the ground. The player is prompted to select an object for the bear to retrieve. 'Bear' in mind, however, that Bernie must not be noticed by the camper. 'Bee'ware that the bear also must not disturb the hive of bees that is lingering overhead. Each item that Bernie the Bear retrieves without being noticed by either the camper or the bees is worth a credit award. 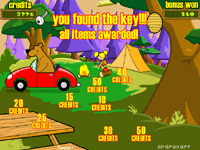 The player continues to select items until the bear is either caught or ends up with an object that contains the keys to the camper's car. If the keys to the car are obtained, all items on the screen are awarded and the second part of the bonus is revealed. This second part of the bonus round is called 'Fool the Ranger'. The object is to disguise Bernie enough to get him out of the park without Roger the Ranger noticing. As Bernie the Bear pulls up in the stolen car, he sees five disguises he can choose from. The player must choose one of the disguises for Bernie to put on. The bear then tries to look convincingly at the ranger. If the ranger motions for the bear to proceed out of the park, a large credit amount is awarded, and the player will have won the bonus round. If the ranger notices something is wrong, he blows his whistle and a police van drives up to haul off the bear. A consolation credit is awarded to the player and the bonus round ends. When the player receives three scattered Tent symbols on reels 3, 4, and 5, the Free Spin Tent Bonus is activated. A popup appears over the last three reels, and three rows of tents emerge. The player is prompted to pick one of the three tents on the first row to receive a number of free spins. The player is then invited to select a tent from the second row to reveal a multiplier. From the third row, the player chooses a tent that reveals a wild symbol that will be used during the bonus round. The player is congratulated and plays the free spins. 5-reel video slot available in 9 line, 9/18/27/45/90/180 coin versions. 5-reel video slot available in 15 line, 15/30/45/60/75/150/300 coin versions. 5-reel video slot available in 20 line, 20/40/100/180/200/400 coin versions.